We are really delighted to be able to host a screening of the documentary 'Aluna' which will be introduced by its Director, Alan Ereira. This film has made by and with the KOGI, a lost civilisation that for four hundred years has been hidden on an isolated, pyramid-shaped mountain in the Sierra Nevada de Santa Marta, Colombia. This mountain is nearly five miles high, on the Caribbean coast of northern Colombia; the different temperature belts that exist at different altitudes up the mountainsides create a remarkable series of micro-climates, such that the Kogis' territory contains a microcosm of the world's climate systems. 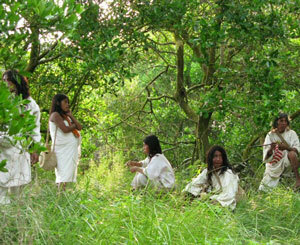 The Kogi believe that they live in order to care for the world and keep its natural order functioning, but they recognised some years ago that this task was being made impossible in particular by the mining and deforestation that is taking place in order to feed the industrial world's insatiable demand for raw materials. The Kogi say that without thought, nothing could exist. This is a problem, because we are not just plundering the world, we are dumbing it down, destroying both the physical structure and the thought underpinning existence. In 1990 they emerged to work with the BBC documentary maker Alan Ereira, resulting in the acclaimed 90-minute film Message from the Heart of the World that was first shown on BBC1. In this they dramatically warned of the need for the world to change course. This film helped shape the Rio Conference, led to the King of Spain visiting the Kogi, and to a complete transformation of the Colombian attitude to these people. Today, each new Colombian President has to visit the mountain and seek their blessing. But now the Kogi have summoned Alan Ereira back, saying that we did not actually listen to what they said twenty four years ago. We are incapable of being changed by being spoken to. They now understand that we learn through our eyes, not our ears. In the face of the approaching apocalypse, they have asked Alan Ereira to make a new film with them, one which will take the audience on a perilous journey into the mysteries of their sacred places, to change our understanding of reality. 'Aluna' is the remarkable result of this collaboration.